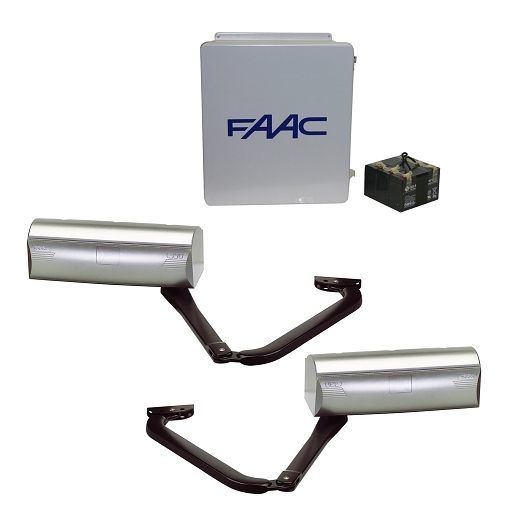 Home > FAAC 390 24 Vdc > FAAC 390 Basic Double Gate Operator Kit- Includes (2) 24VDC Operators, E024U Control Panel, 14x16 in. Enclosure, Transformer Batteries (2), and 2 Limit Switches. FAAC 390 Basic Double Gate Operator Kit- Includes (2) 24VDC Operators, E024U Control Panel, 14x16 in. Enclosure, Transformer Batteries (2), and 2 Limit Switches. FAAC 390 electromechanical swing gate opener is specifically designed for residential applications. The FAAC 390 is designed to primary accommodate large pillar installations. Also ideal for use on " carriage style" swinging garage doors. The self-contained FAAC 390 24v Opener consists of a irreversible electromechanical motor and articulated arm. The locking the FAAC 390 ( 104572.5E ) 24v Operator provides in the fully opened and fully closed positions is a service device rather than a security device. ∗ It is a solid-faced gate. ∗ The length of the gate leaf is 6 ft (2 m) or longer. ∗ The installation requires tight security. ∗ The site is subject to vandalism. ∗ The site is subject to strong or very gusty wind In two-operator gate installations, both (master/slave) operators are wired to one control panel. The electronic control panel is a microprocessor-based controller that accepts a wide range of product accessories and reversing devices, thus allowing for flexible gate system design.